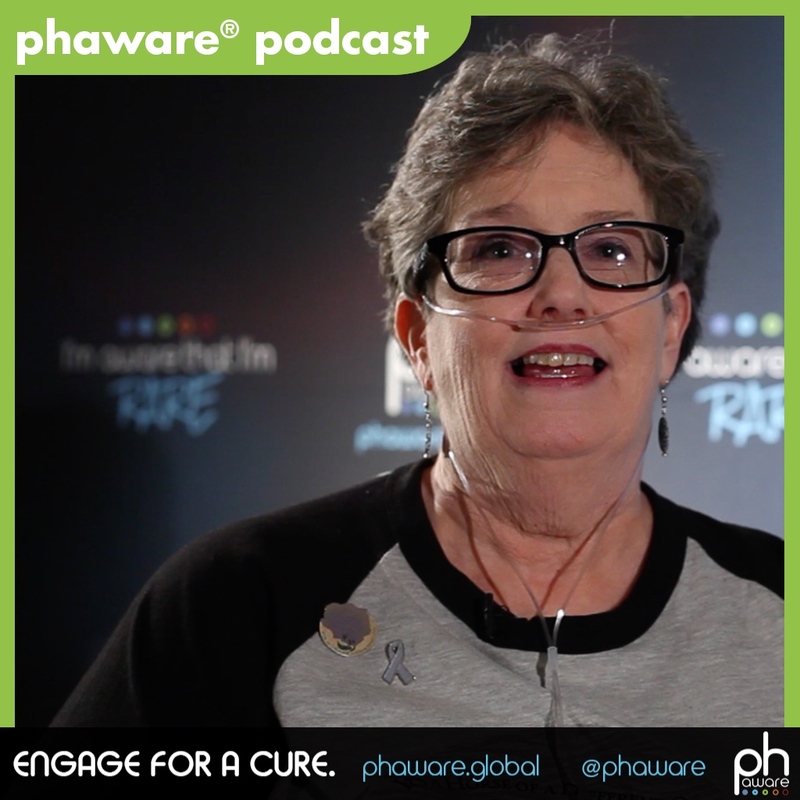 Pulmonary hypertension patient Barbara Thompson discusses why she wears zebra clothing 365 days a year and her long road through 14 doctors before a young grad student gave her a proper PH diagnosis. Hi, I'm Barbara Thompson. I'm a pulmonary hypertension patient. We used to do weddings as a family business. We did everything: photography, video, cakes, catering, flowers, directing, reception hall, chapel. But the last thing I remember in April of 2000, was getting a bride down the aisle, and then I don't remember anything until December of 2002, because when your brain is not getting enough oxygen, you don't remember things. I became bedridden. My husband, Chuck, took me to 14 different doctors before I was diagnosed. 14th doctor had just graduated from medical school, so he was a little gung ho with stuff. And thank God he was. He said, “nobody has bronchitis this long. Let's look and let's take an echocardiogram, see what's going on.” So, he did that, and he called back in about week, and he said, “you probably need to come into the office and let's talk about this.” I said well what's going on, and he said, “pulmonary hypertension.” And all I heard was hypertension. And I said okay, hey give me a pill, and we're ready to go. And he said, “it's a little bit more complicated than that.” Then I had right heart catheterization and even though my numbers were very low at 27, 31, I was class 4. They said for our daughter that was getting married very soon, to move her wedding date up if they wanted me to be there. They basically gave me 6 to 9 months to survive and December 12, 2018, it'll be 16 years. It's been very frustrating, because people aren't aware of the disease. I wear a zebra every day to help raise awareness. I developed a little card that explains the (medical) zebra analogy on one side, and a little bit about PH or pulmonary hypertension on the other side. I give those out on a regular basis. I've probably given out five or six thousand of them over the years. That's the purpose of wearing zebra every day, 365 days a year. When people look at me funny, I'll take a card out of my pocket, pants always have to have pockets, whip out a card, give it to them and say this is why I wear zebra. Just take a look at it, this will explain the zebra analogy to you a little bit and pulmonary hypertension on the other side. Then I'm on my way again, so they don't feel like they're compromised. And I'll tell cashiers if they say something about the oxygen. I'll give them a card and just say well, read this when you get a chance. My mother-in-law died from pulmonary hypertension, as did my sister-in-law and probably a grandfather-in-law. So, it's familial on my husband's side. And then it's idiopathic on my side. People need to be aware of this, because my sister-in-law went to bed one night and didn't wake up the next morning and she was 35 years old. At the autopsy is where they saw that there was a problem with pulmonary artery. It had constricted. And they said that was the reason for her passing. If you don't understand something ask. If you don't understand that, get on the Facebook groups. There's always somebody on Facebook that can answer your question. I have a list of places that will explain pulmonary hypertension in lay terms, as well as scientific terms or medical terms, that I send those links to different people, so they can understand what's going on with their body. One thing that I wish I had known that a doctor didn't tell me was that this is not a death sentence. There is hope. Try to stay upbeat. Wear zebra. My mission in all of this is that when a woman feels a lump in her breast, she goes to her doctor and says could this be breast cancer. I want when a person has shortness of breath, fatigue, bluish tint to their lips, nail beds, swollen ankles, the extreme fatigue, which was my worst thing, and also hoarseness, because of the enlarged pulmonary artery. When they have those symptoms I want them to go to the doctor and say could this be pulmonary hypertension? I am Barbara Thompson. And I know that I'm rare.